Foreign Aid or UK Aid? The English TUC has always enjoyed keeping you informed. Below is an overview of the Foreign Aid facts and figures. The article makes interesting reading. In recent weeks there has been a growing call for the Foreign Aid budget to be cut and the money to be used to give our nurses, police and firemen a pay rise. The English TUC agrees with those calls because it is an absurd situation that the Government maintains austerity, higher taxes, borrows more than £6.5million an hour and then spends the proceeds on projects overseas or on higher salaries for ‘The Department for International Development’ staff. It also needs to be pointed out that UK food bank use is continuing to rise according to new data from anti-poverty charity, The Trussell Trust. 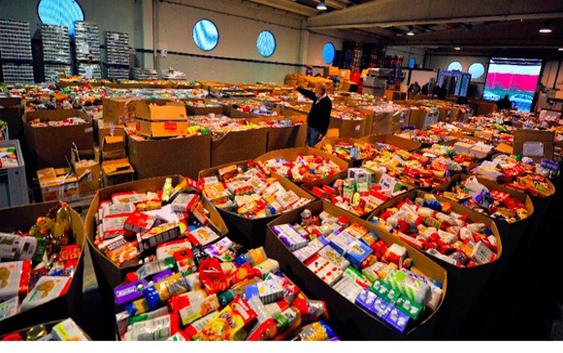 They have highlighted that between 1st April 2016 and 31st March 2017, The Trussell Trust’s Foodbank Network provided 1,182,954 three day emergency food supplies to people in crisis compared to 1,109,309 in 2015-16. Of this number, 436,938 went to children. For every hundred pounds that’s made in the UK, seventy pence goes towards foreign aid. Another way to say this is that the government has a target to spend 0.7% of the UK’s Gross National Income on overseas development aid each year. Gross National Income (GNI) is the UK’s annual output of goods and services, plus any income we get from abroad. In 2015, the UK spent £12.1 billion on overseas aid, in line with the 0.7% target. Because the UK economy is set to get bigger over the next few years the real value of development aid spending is expected to increase. By 2021 we could be spending about £14.4 billion, based on the Office for Budget Responsibility’s forecasts and in 2015 prices. That’s a bit uncertain though; the amount we actually end up spending will depend on how much the economy grows. Where does the target come from? 0.7% is the UN’s target for all developed countries and has been since 1970. In principle the UK government has been signed up to the target since 1974 but it only achieved it for the first time in 2013. In 2015 it was put into UK law, which means that the government has a legal duty to meet the 0.7% target. The legal duty can’t be enforced through the courts but the International Development Secretary has to explain herself to parliament if we don’t meet it. Only about 16% goes as humanitarian aid, or crisis relief, with the rest focused on strategic or long-term goals. 37% of the money goes via multilateral organisations, like the United Nations. The other 63% goes to programmes in specific countries as bilateral aid. The five biggest recipients of bilateral aid are Pakistan, Ethiopia, Afghanistan, Nigeria and Syria. When it comes to continents, significantly more gets spent in Africa (55%) and Asia (41%) than anywhere else. The Department for International Development (DfID) is responsible for most of the UK’s aid spending. They spend 81% of our ODA target; the rest is spent by other government departments and organisations. How much is £12.1 billion? And is it too much? The 0.7% target has had a long history of opposition, most recently from people who argue that the money would be better spent on domestic priorities, like social care or defence spending. But it’s hard to say whether we’re spending ‘too much’ just by looking at the numbers alone. As an example: from one perspective, £12.1 billion is roughly four or five times one estimate for the shortfall in social care funding; but from another perspective, it’s a bit less per household than one estimate for the food we throw away. Which is the more appropriate comparison? It’s a matter of judgement. 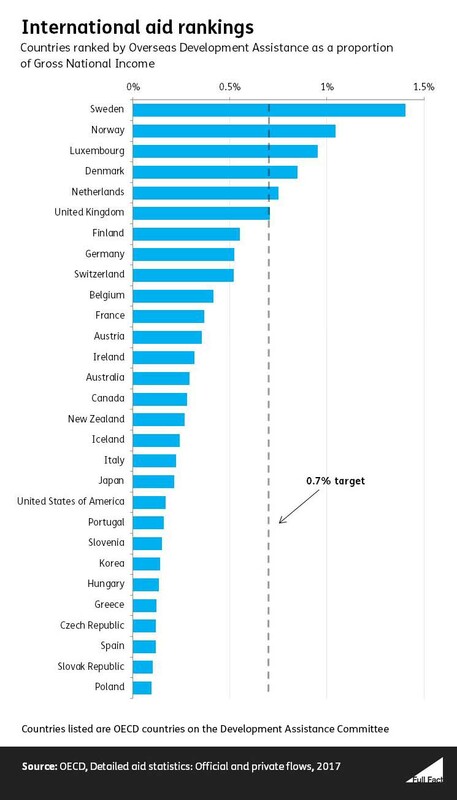 Only five other countries hit the UN’s 0.7% target for development spending. That makes the UK the sixth most generous country in the world, if you take its spending as a proportion of GNI. Isn’t it nice to have the whole picture? We rely on your donations to continue and grow our factchecking efforts – to help us maintain our independence we need 1000 donors to give £10 a month. We are currently at 351 – please help Full Fact grow.